Red Jet, all the way from Georgetown, last win at Rising Sun. on new year’s eve at the Rising Sun Turf Club, Arima Park, West Coast Berbice. This is so because Red Jet, all the way from Georgetown that won the previous meet, in addition to the Rising Sun and President’s Cup meets will battle Storm Bird again that has three straight wins and the horse’s jockey will be looking to make it four in a row for the “Rematch”. The meet which is organised by the Jumbo Jet Auto Sales and Racing Stables in collaboration with the Rising Sun Turf Club, has been attracting tremendous attention over the past few days, with numerous entries. Eight races are listed for the programme which has over $7M in cash prizes up for grabs. The feature event for animals classified D2 and lower over 1800M has the top winning take of $1M and a trophy with the likes of Princess She Not, CP Got Even, Golden Blue Ecko, Lady Budapest, Honey Flow, Score Even, Just Call Me Boss, Spit Fire, Jack in My Style, Release the Beast and Light up Canada looking for the big pay day. The other events are – the race for horses classified E1 and lower West Indies bred non earners for 2016 and E3 US and Canadian bred non earners for 2016, running for a winning money of $600,000 and trophy over 1400M. The event for 4 years old West Indies Bred and animals classified G3 and lower carries a winning pocket of $300,000 and trophy over 1400M. Horses classified H and lower will race for a winning take of $275,000 and trophy over 1100M. The 3 years old West Indies bred and I1 and lower horses will cover 1400M for a first prize of $225,000 and trophy. There is an 1100M event for three year old West Indies bred horses maiden animals for $220,000. 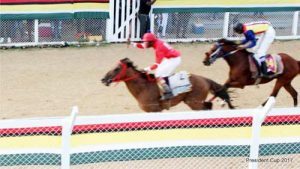 The event for three and four year old Guyana bred maiden horses carries a winning prize money of $200,000 and trophy over 1100M. The J2 and K class event has its first prize tagged at $175,000 and trophy over 1100M. The animals classified L and lower will compete for the winning pocket of $130,000 and trophy over 1100M. The top Jockey along with the runner up, the top stable and champion trainer will all be presented with trophies and other incentives compliments of the Trophy Stall of Bourda Market and the organizers. Interested persons can contact Fazal Habibulla on 657-7010 or 232-0232, Donald Lawrie on telephone Nos 225-4530, Campton Sancho 602-1567 or Ramnauth on 697-1979.